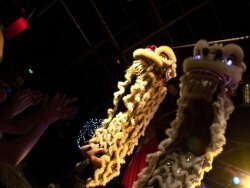 After the busy Chinese New Year period, the Chinese Community Centre Lion Dance Troupe returned to be part of the Twisted Vaudeville Circus. The new production the Twisted Vaudeville Circus has created was called Puppet Peep Show. The theme of the show is the coming alive of puppets. The show had many acts which included Fire eaters, acrobatics, burlesque, and pole dancing. There were many familiar faces back stage of the show but also a lot of new faces. A featured act of the show was Adam Davis who is an acrobat from Circus Du Solei. Prior to the start of the show there was already a long line outside the Fremantle Fly By Night Club. The show was at a sold out capacity with the audience enjoying each of the acts the show had to offer. The Twisted Vaudeville Circus has improved itself from each show by offering more acts and talents. 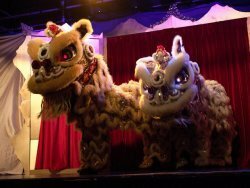 The Chinese Community Lion Dance Troupe is so proud and happy for the Twisted Vaudeville Circus in seeing how successful they have become since the first show. We will like to thank Kelly Cook for allowing us to be part of this wonderful family, and hope that we will continue to help contribute to the success and growth of the Twisted Vaudeville Circus. The City of Swan held their annual Ballajura Harmony Festival for 2011 with this year’s festival being bigger than the previous year. The purpose of the festival is to bring harmony to the community through sharing the diverse cultures of the world to the community. The Festival featured many different cultural acts such as African dances, Reggae Performances, Indian cultural dance, and of course the Chinese Lion Dance. There were other activities on the day that entertained the kids which included jumping castles, face painting, and gladiator gauntlets. The Chinese Community Centre Lion Dance Troupe closed the event with their lion dance performance. The troupe performed a 3 lion performance for the audience, and the performance was very much enjoyed by all. The Chinese Community Centre Lion Dance Troupe will once again thank the organisers of the Ballajura Harmony festival for inviting us to participate in this event which has such a meaningful cause. The Chinese Community Centre (CCC) Lion Dance Troupe was invited by the Rossmoyne Chinese Mandarin Hub to perform at their cultural event “Rossymoyne Hubs Got Talent”. The purpose of the Rossmoyne Chinese Mandarin Language Hub is to establish closer links between local schools to promote an increased student engagement in Asian languages (Chinese Mandarin) in schools. The Rossmoyne Chinese Language Hub actively engages students in the Chinese culture by teaching them the Chinese cultures such as dance and martial arts. Students are given the opportunity to learn and participate in these cultural activities. The Rossmoyne Chinese Language Hub was launched on Wednesday, 23 June 2010 and is collaboration between Rossmoyne Senior High School, and its feeder schools Bateman Primary School, Brentwood Primary School, Oberthur Primary School, Riverton Primary School, Rossmoyne Primary School and Shelley Primary School. Rossmoyne Hubs Got Talent is an event that allows students to demonstrate and perform the Chinese cultures that they have been taught. On the night there was a diverse nationality of students performing Chinese dance, songs, theatre and martial arts. To finish the event off, the CCC Lion dance troupe performed the lion dance for the diverse crowd. 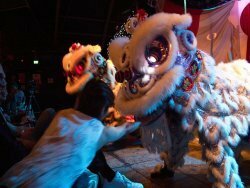 During the performance organisers will explain to the audience the purpose and symbolism of the Chinese Lion Dance. Overall the event was enjoyed by all who attended. 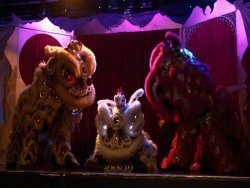 The CCC Lion dance troupe truly supports the cause of the Rossmoyne Chinese Mandarin Hub in sharing and educating other nationalities the Chinese culture and allowing active participation. We will like to thank all the organisers for inviting us and making the event a success, and may we all continue to share the Chinese culture to all who is interested. The Chinese Community Centre (CCC) Lion Dance Troupe performed at the Harmony International Folk Festival for the 4th consecutive year. The event once again featured many diverse performances from different cultures. Cultures included Indian, Irish, and Thai. The event was organised by the Australian Asian Association. The aim of the Festival is to celebrate Harmony week and to share the diverse cultures that make Australia the unique country it is. The CCC Lion dance performed a new 3 lion routine for the event, and received great reviews for their performance. The troupe definitely enjoyed being a part of the event, but most importantly interacting with the diverse bunch of performers back stage and sharing and learning each other’s culture. The troupe will like to thank Marlene for the invitation to the event, and will like to praise her on her countless effort on organising such a great show for the audience and the performers.